But in small apartments, their usage is especially critical since they help create an illusion of a more spacious space. Let’s take a look at some of the ways you can use mirrors in your home décor. This trick is used to create a visual focal point in the environment. By adding a visual centerpiece, you are focusing all the attention to the said mark, making the room look bigger. For this effect, you need oversized mirrors with frames. Frame the mirrors in a way so they fit the style and the design your are striving for. Most importantly, dramatic mirrors add height to the room, and if your ceiling is very low, the best way is to go for floor to ceiling mirrors. The dynamics of the room instantly change with just one mirror. We have mentioned several times before that multifunctional furniture is the way to go for small apartments, but what about multifunctional mirrors? When you are short and tight in space, mirrors can be placed on closet and cabinet doors. This way, mirrors not only visually enlarge your room, they also serve the purpose of decoration. You can use them on your decorative shelving and make them work the room. Dark accessories and dark wall make the room feel cold and small. Dark tones tend to shrink the room, but sometimes people love the dark color and its depth, richness, and texture. In order to counter the effect of the dark color, you need to install mirrors on the same dark wall. The mirror will reflect the light side of your apartment and hide some part of the dark wall. To take full potential of the trick, you can place flowers, greenery, water elements and natural elements on the opposite side of the mirror. One of the main purposes of mirrors is to reflect light. This is one of the main purposes people install mirrors in their home. When the apartment feels small mirrors help reflect more light into the apartment. For this effect to be maximized, you need to reflect the decorative nature of the environment, including shiny surfaces in a way to create a sophisticated room. And in the same time, mirrors will reflect the natural flow of light and create the illusion of a larger space. 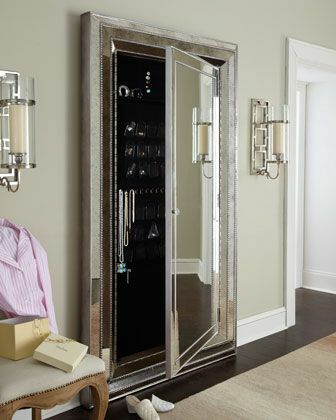 Same as with any room in the apartment, mirrors can help visually enlarge the bathroom. And when it comes to small apartment, the bathroom is usually the room to pay the highest price for saving space. A tight bathroom can be enlarged by using mirrors behind the sink. Mirrors can be placed in a floor to countertop approach, a trick that gives the illusion of space and reflects much more light into the bathroom. Another trick you can use is to place hanging mirrors floating in front of the window in the bathroom. While most people use mirrors to visually enlarge their space, they forget one of the best properties of windows, which is their ability to create art. 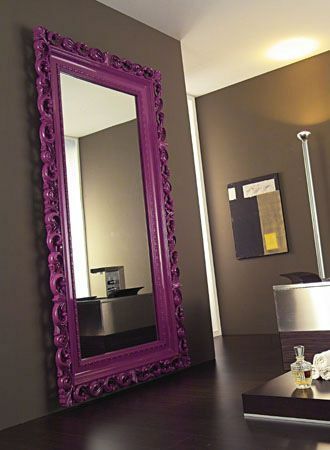 Every mirror can be a piece of art in your space, provided it is properly placed and decorated. In almost any retail and furniture store you can find some beautiful artwork and masterpieces made from glass.